Forty years ago, Taxi Driver was released to critical and popular acclaim and its most famous line, “You talkin’ to me?” instantly became one of the most memorable lines in film history. The film was the second of eight feature film collaborations (so far) between Robert De Niro and Martin Scorsese and established Paul Schrader as one of Hollywood’s most important screenwriters. 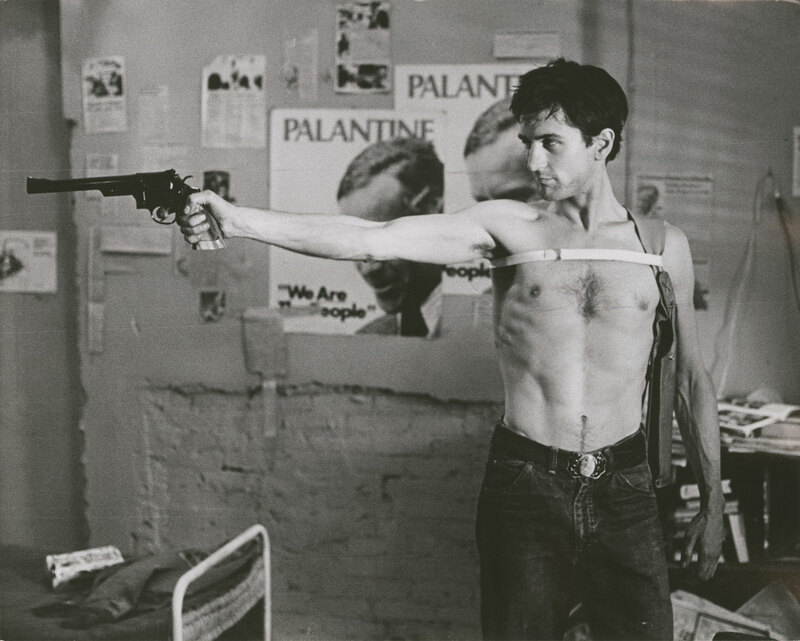 Film still from “Taxi Driver” (1976). 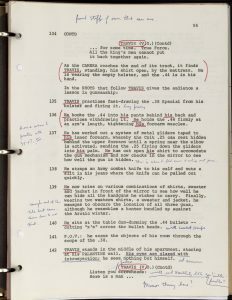 Robert De Niro’s copy of the Taxi Driver script includes his handwritten notes and provides insight into how he constructed his performance and how improvisation is incorporated into the filmmaking process. This page shows Travis Bickle, the film’s main character, alone in his apartment, rehearsing for an impending violent confrontation. 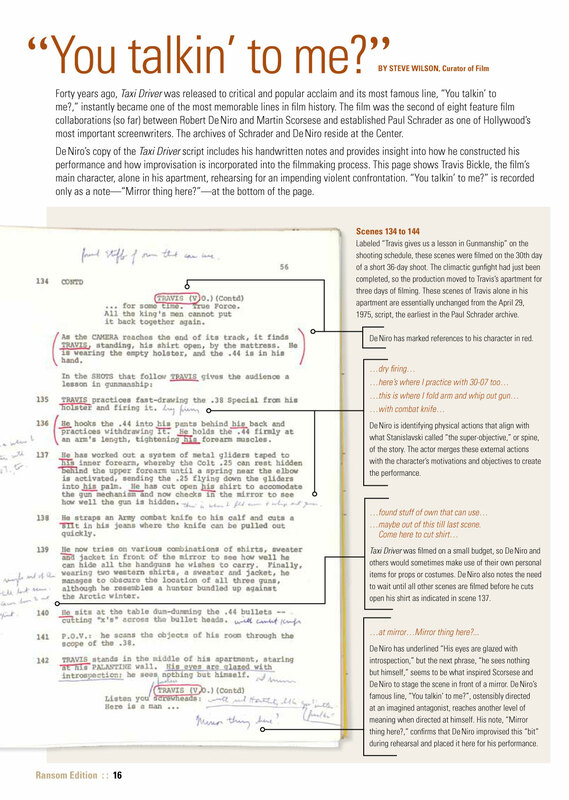 “You talkin’ to me?” is recorded only as a note— “Mirror thing here?”—at the bottom of the page. Robert De Niro’s copy of the “Taxi Driver” script. Labeled “Travis gives us a lesson in Gunmanship” on the shooting schedule, these scenes were filmed on the 30th day of a short 36-day shoot. The climactic gunfight had just been completed, so the production moved to Travis’s apartment for three days of filming. These scenes of Travis alone in his apartment are essentially unchanged from the April 29, 1975, script, the earliest in the Paul Schrader archive. De Niro has marked all references to his character in red. De Niro is identifying physical actions that align with what Stanislavski called “the super-objective,” or spine, of the story. The actor merges these external actions with the character’s motivations and objectives to create the performance. Taxi Driver was filmed on a small budget, so De Niro and others would sometimes make use of their own personal items for props or costumes. De Niro also notes the need to wait until all other scenes are filmed before he cuts open his shirt as indicated in scene 137. De Niro has underlined “His eyes are glazed with introspection,” but the next phrase, “he sees nothing but himself,” seems to be what inspired Scorsese and De Niro to stage the scene in front of a mirror. De Niro’s famous line, “You talkin’ to me?”, ostensibly directed at an imagined antagonist, reaches another level of meaning when directed at himself. His note, “Mirror thing here?”, confirms that De Niro improvised this “bit” during rehearsal and placed it here for his performance. This note, as well as De Niro’s first note on the next page, refers to Travis’s voice over narration. Flagged as “Very Imp[ortant]”, De Niro changes “…who wouldn’t take it anymore” to “…who would not take it anymore” and adds “…very formal when writing to self but in conversation informal using improper Eng[lish].” The difference in his modes of expression emphasizes Travis’s struggle to organize his thoughts. 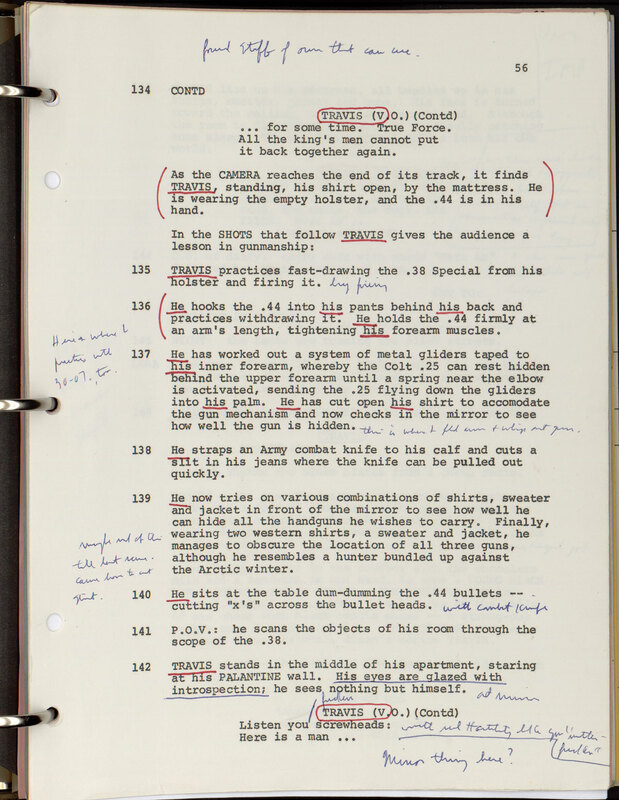 This page is characteristic of De Niro’s scripts. Extensive background research and meticulous script interpretation are important parts of his process and are evident throughout his collection. Since the construction of a film performance is an understudied area in cinema studies, the De Niro archive is particularly rich with opportunities for research. The Ransom Center holds the archives of both Robert De Niro and Paul Schrader. Both include rich materials related to their collaborations with each other and with Martin Scorsese.